Sanitary Pads - How Safe? Sanitary pads are used by every woman. During the monthly menstrual cycle, the number of pads used varies from woman to woman. Sanitary pads come with certain health issues too, and it all depends on how you use your sanitary pads. Sanitary pads are made from a range of materials, depending on the style, country of origin, and brand. Materials used are cotton, dioxin, ctachlorinated dioxin (OCDD), hexachlorodibenzofuran (HxCDF) and octa-chlorodibenzofuran (OCDF). Dioxin is the shiny white material found on the pad. Dioxin contains cotton inside. Cotton is made to look pure white because of dioxin. Dioxin accumulates in the fat stores of the body and can add up to very dangerous residual levels over time. Cotton in the pad: There are certain chemicals sprayed on the cotton crops to destroy pesticides. These chemicals stay in the fibre and make them dangerous to use. The chemical "furan" that is added stays for a longer time and causes potential harmful effects to the body over a period of time. A plastic cover on the pad can cause local allergies and irritation. Since your skin is in contact with the sanitary pad, certain infections can gain entry into your body. 1.Change your pads at frequent intervals. 2.Don't go for scented pads as they are very harmful and can create irritation. 3.Apply creams if necessary only after consulting with your doctor. 4.To avoid foul smell, clean your private parts at frequent intervals. There are many harmful effects of using pads: miscarriage, breast and ovarian cancer, impaired fertility etc. The chances of these increase if the pads are worn for a long time and one doesn't maintain good personal hygiene. 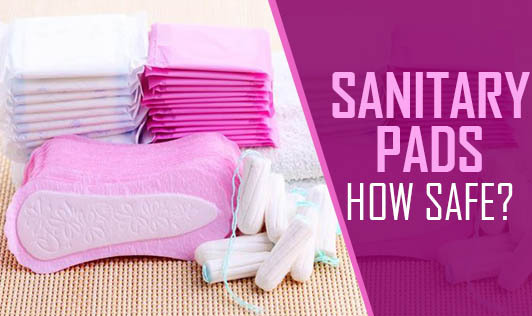 Since there are not many substitutes available for sanitary pads, it is important to maintain good hygiene.